Work Experience - A Reader Writes! 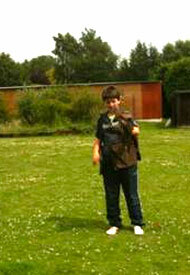 My name is Harry Studd and I have just completed my two weeks of work experience at the Suffolk Owl Sanctuary. When I arrived at the Sanctuary at the start of the project, the first thing I was taught to do was how to transfer some of the flying display birds who spend their nights in the mews room to the outdoor weatherings by one of the falconers, Matt. This was brilliant, just picking the birds up from their boxes and placing them on their perches for the day. To keep them from flying away the falconers tether the birds to their perches with a soft leash with what’s known as a falconers knot. The knot itself is very simple but difficult to perfect because you have to do it with one hand as you have a bird on your other wrist, so when I took the birds out for the first few times Matt helped me with my knot and taught me how to do it. Every day at the centre I had a specific morning routine, which included getting the birds out of the mews room, followed by a cup of coffee, and then cleaning out and wiping down the birds' boxes in the mews room, followed by preparing the birds' food which included chopping up frozen chicks, rats and quail into pieces. At first I found this work quite gruesome but after a few days I got used to it. Then I helped clean out the aviaries of some of the birds that fly in the displays, and some of the big aviaries which held Tawny Eagles, a Black Vulture and a Steppe Eagle. Another thing I did quite often during work experience was PAINTING!!! I painted the flying owl aviaries and the outside of the falconers hut, which took up a lot of time but was worth the hard work. Sometimes I got the paint onto the aviaries and buildings beside all over me. I learnt a lot about all of the owls at the centre from the flying displays and also asking the falconers questions about the birds. I found out quite a lot I didn't know especially that there are many myths about owls - e.g. all owls are nocturnal and that owls are very smart - which are not true. Many owls are not nocturnal because they fly at dawn & dusk, and owls are not very bright, either. This is because their brains are proportionately quite small compared with the size of their head as they have big eyes and ears which leaves very little room for a brain. If we take Cecil as an example, when we look him we can only see about 30% of his eye because they are shaped like Cornetto’s - we can only see the 'ice cream' part at the top and the cone part is actually inside Cecil’s head. Also Cecil is a lot thinner than he looks - without all his feathers he would look a lot thinner! Cecil is a Spectacled Owl which I flew three times whilst I was at the Sanctuary and that was the best part about my work experience. Also during the time I flew Auckland, a Little Owl and Cobweb, a Barn Owl. My favourite bird at the centre has to be the Common Buzzard, Ash - this is because he is a great flyer and has a great personality. It wasn’t just me on work experience as we had another boy from Thomas Mills High School whose name was Luke Mercer. We got on very well and enjoyed each other’s company and had a good laugh together. We did most of the jobs together like cleaning the aviaries and painting as well as flying the birds which he and I thoroughly enjoyed and want to do again. I would just like to say thank you to everyone at the Suffolk Owl Sanctuary who had to put up with me for two weeks and I can’t wait to come and help in the summer. See you then!